Starting its second year as an independent entity Grand Seiko has a number of special and interesting models being announced at Baselworld. 2018 represents the 20th Anniversary of the launch of the 9S calibre that is the basis for the modern mechanical Grand Seiko models. To commemorate this anniversary Grand Seiko is releasing three limited edition models. The first and most interesting model is the SBGH265. This is a limited edition of 15 pieces and is a Hi-Beat VFA model. It has a 9S85 (VFA) 36,000bph movement housed in a Platinum 950 case. The 9S85 Hi-Beat 36,000bph calibre is rated at +3 to -1 seconds per day, and this performance is achieved by the highest level of adjustment and a testing program of 34 days (double the Grand Seiko standard). The case for this Grand Seiko has a distinctive design and blends the differing textures of brushed and zaratsu polished surfaces. The dial surface has an intricate spiral pattern featuring the characters GS and the Daini logo. The movement’s automatic rotor features an 18K GS lion emblem. This model is a limited edition of just 20 pieces. Another new model in the Grand Seiko line up is the SBGH266. This has the same shaped case as the SBGH265 but instead of a platinum case it has an 18K yellow gold case and strap clasp. The dial features the same pattern with the GS characters and the Daini logos as the VFA version but instead has golden markers and is marked Special. The watch has the same 9S85 calibre movement but is rated to the Special grade of +4 to -2 seconds per day. 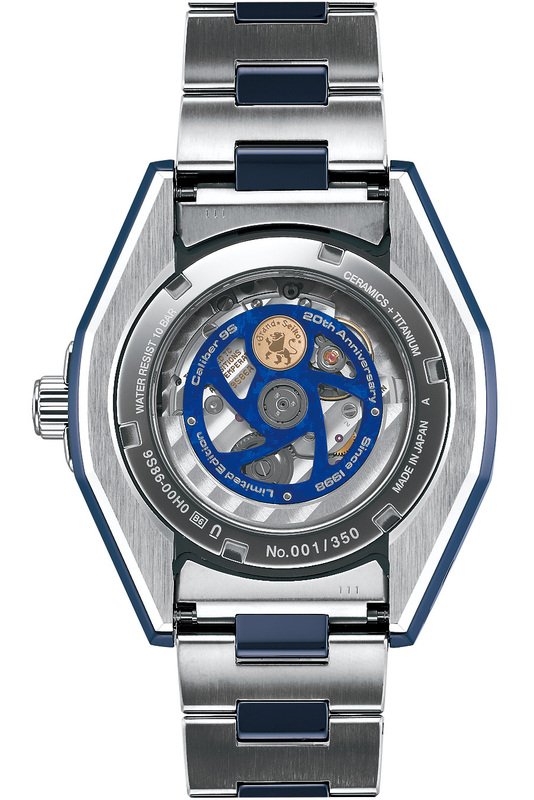 The movement’s automatic rotor features an 18K GS lion emblem. This model is a limited edition of 150 pieces. The third model in the series is the SBGH267 that is provided with a stainless steel case. This watch is also provided with the same 9S85 movement but it has been regulated to the standard GS grade of +5 to -3 seconds per day. The watch has the same GS / Daini logo dial pattern but this time is in blue. The rotor is made of titanium and tungsten and has a blue anodic oxidation surface treatment. Another new Grand Seiko model released is the SBGJ229 blue ceramic limited edition. This watch has a 9S86 GMT Hi-Beat movement that is regulated to the Special grade of +4 to -2 seconds per day. The movement is housed in a case that has a blue zirconia ceramic outer section and inner bracelet links, this material is seven times harder than stainless steel. The bracelet outer links and watch inner case is manufactured from high intensity titanium. The dial on the watch, like the other 20th anniversary 9S models, features a spiral pattern and shows the characters GS9S. The rotor is made of titanium and tungsten with a blue anodic oxidation surface treatment and golden GS lion emblem. 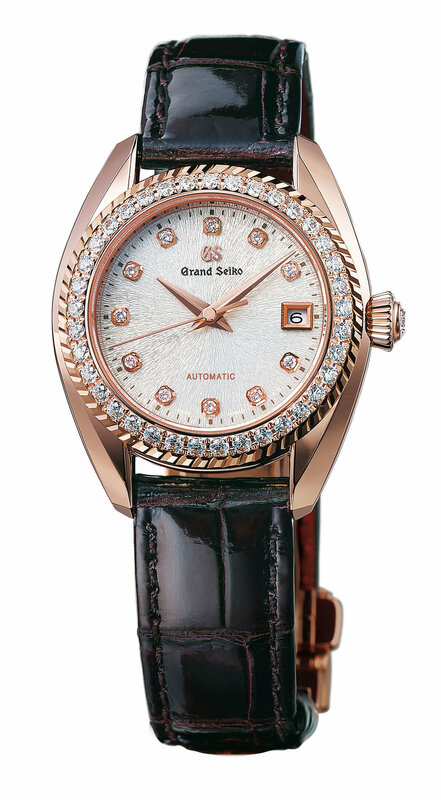 The other new Grand Seiko model is the ladies STGK002 that features a new 9S25 33 jewel automatic movement. This caliber is just 19.4mm in diameter and 4.49mm thick with a 50 hour power reserve and numerous components, like the pallet fork and escapement wheel, that have been produced utilizing MEMS technology. The impressive ladies movement is housed in a rose gold 18K case that has a bezel set with 37 diamonds and a larger diamond in the crown. 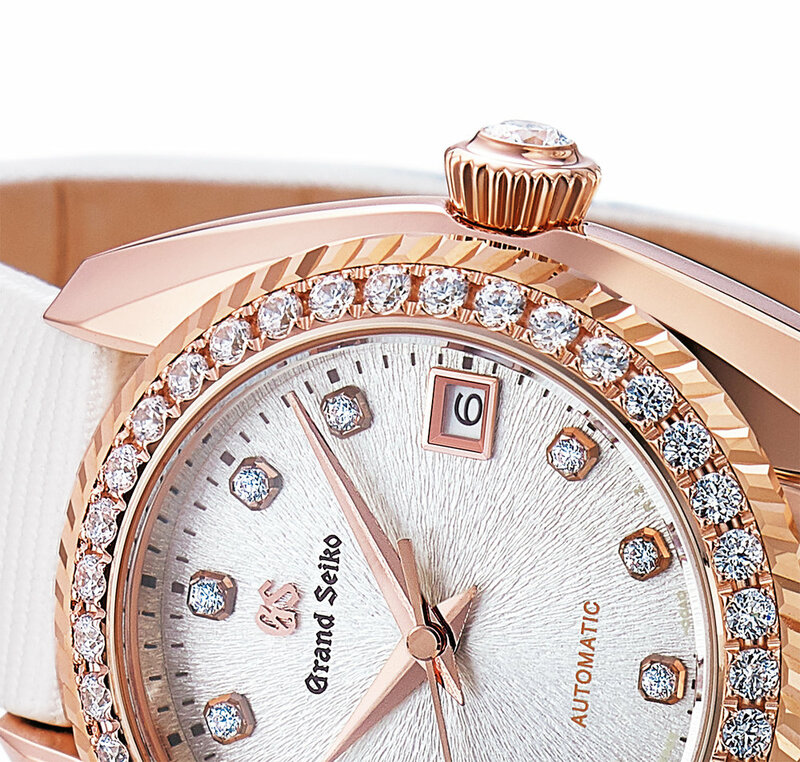 The silver lamé dial resembles the snow texture from Mount Iwate and it features diamond hour markers. Both black and white crocodile straps are provided. The watch is hand assembled at the Shizukuishi Watch Studio in Morioka and it undergoes the same rigorous 17 day testing procedure as the larger men’s mechanical Grand Seiko models. It is great to see Grand Seiko expanding their offerings and again offering a high end mechanical ladies models.